After striking out 14 batters and allowing no walks in Thursday’s win over the Arizona Diamondbacks, Yu Darvish has put himself in elite company. Since 1900, Darvish, Johnson, Clemens and Pedro Martinez are the only pitchers with at least three career starts of at least 14 strikeouts and no walks. 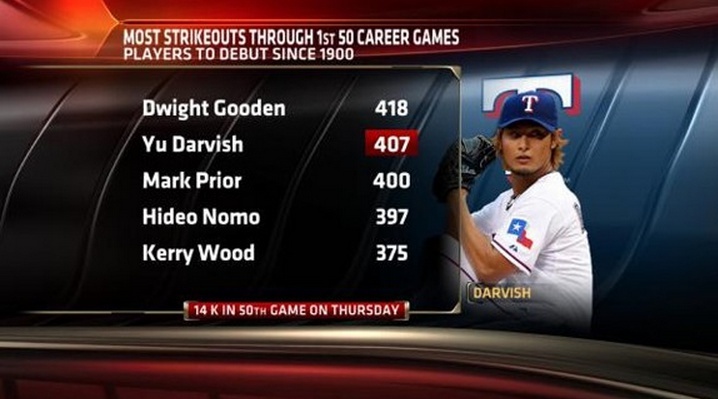 Darvish now has 407 strikeouts in his first 50 career games, which ranks second among pitchers to debut since 1900. The only pitcher with more strikeouts in their first 50 career games is Dwight Gooden (418), according to the Elias Sports Bureau. Darvish’s 16 games with at least 10 strikeouts also rank second to Gooden in the modern era in a pitcher’s first 50 games. How did Darvish shut down the Diamondbacks hitters? • Darvish struck out 14 of the 20 hitters he took to a two-strike count. Every Diamondbacks hitter faced a two-strike count Thursday but Cody Ross was the only one not to strike out at least once. Overall, Darvish has taken 14 different Diamondbacks hitters to a two-strike count this season and he's struck out all 14 of them at least once. • Seven of Darvish's strikeouts came on his breaking balls, five on his fastballs (2/4-seam) and two on his splitter. Darvish's fastballs averaged 91.9 mph before two strikes and 95.3 mph with two strikes, the second-largest differential (3.4 mph) of his career. • Darvish had nine strikeouts in the zone and five strikeouts looking, both career highs.